Fontana, Calif., - The Fontana Walks! Program is celebrating its one year anniversary and you are invited to the party on Saturday, August 18, 2018 starting at 7:00 a.m. in front of the Steelworkers' Auditorium (8437 Sierra Ave.). The day will begin with a warm up, brisk walk and cool down with Healthy Fontana staff. Following the walk, enjoy the free resource fair with healthy snacks, beverages and giveaways. The community walks will continue on the third Saturday of each month. Fontana Walks! started August 2017 when the City launched a free walking program to encourage the Fontana community to move more for better health. Since its inception, the community has walked close to 3 billion steps. That is equivalent to over 1.3 million miles. As an incentive for participants to join, anyone who registered for the program received a free pedometer, water bottle, and a Healthy Fontana t-shirt. Harvard Health Publications reported that people increase their overall physical activity by 27 percent after they began wearing a pedometer regularly. And, regular physical activity helps reduce the risk of one of the most common causes of premature death: heart disease. At the end of each week since the program began, participants logged their steps using the online Fontana Walks! tracking system. Participants who submitted their steps online were placed in an opportunity drawing and prizes were distributed at monthly community walks. Prizes included fitness equipment, healthy cooking baskets, and entry to local gyms. Healthy Fontana partnered with many organizations over the past year and looks forward to continuing to provide Fontana Walks! to the community. 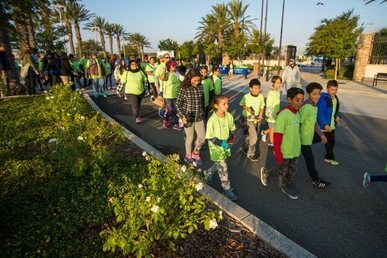 Through the support of Kaiser Permanente, Fontana Walks! monthly community walks will continue on the third Saturday of the month. Kaiser Permanente’s community benefit grants support organizations such as Healthy Fontana that provide free and/or low cost programs and services to the underserved and uninsured throughout San Bernardino County.